Healthy leadership teams produce healthy churches! This material can help you strengthen your team. Included in this series are the New Testament leadership principles to train elders to provide protection, direction and correction in the local church. Twelve sessions taught by the four authors of the book: Larry Kreider, Ron Myer, Steve Prokopchak and Brian Sauder! This training can be used for retreats or during regularly scheduled meetings. The complete set includes a copy of The Biblical Role of Elders book, a leader’s guide, three DVDs and six student manuals. 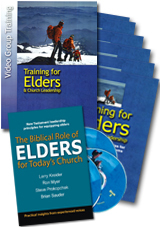 Additional Elders Training Manuals and The Biblical Role of Elders books can be purchased separately.